The Itch are happy to announce that we are about to embark on a collaboration with management agency Concept Sweden Mgmt. (http://www.conceptsmgmt.se/) It will be interesting to see what we can cook up with the help and advice from a management so dedicated to the struggling musicians as Concept Sweden Management seem to be. A new chapter is about to begin for our band. Here's a link to a video with footage from when we played at Sweden Rock festival in 2010. Check it out! Three broken ribs and a puctured lung! ”It hurt so bad I couldn't cry for help. Hell, I could hardly breath” says drummer Johan recovering from this..... incident. When we called him on the phone he seemed to be in a really, really, REALLY good mood though. We all keep our fingers crossed that he will be strong and fit in time for the next gig, march 15th at Offside, Jönköping. And perhaps not so giggly. What happened? Well, apparently it takes more than one drummer to change a light bulb. For his next birthday we're giving him a proper ladder. Get well soon Johan! What a big crowd at Debaser, Malmö, where we played with Dirty Passion last month. We had a great time! Stay tuned for more live dates to come. Good news for you out there who still miss a copy of our album "Spreading Like Wildfire". It is now available at www.musicbuymail.eu and with quite resonable shipping costs too. Check 'em out! Don't forget to take a look at the cool photos of The Itch live by Anna Winberg we've posted here on our website. We're proud to announce that The Itch has been listed twice for the categories of "Best Album of 2011" as well as "Best Debut Album for 2011!" We had a blast opening for our old heroes in Electric Boys at the fabulous Zaragon Rock Club! Cool photos from this gig, and other various performances are coming up soon! We try to get out on the road as much as possible but are in dire need of a proper booking agency. Getting it all together takes time and a lot of hard work! Rest assured, we'd rather be on stage doing what we do best! Hope to see all of you soon! Feel free to (share) and check out our Facebook page often for frequent updates of all sorts in 2012!! 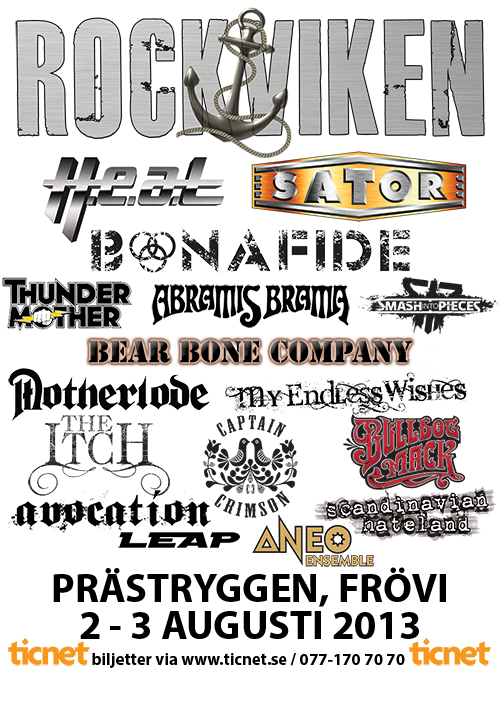 If you happen to be at the number 1 hardrock/heavy metal festival in Scandinavia, Sweden Rock Festival, don't hesitate to say hello if you spot us in the crowd of 33 000 beautiful hardrock loving people. We'll be there somewhere! The release party will be held at Bodoni, Bergsgatan 20 in Malmoe, May 27th and YOU are very welcome! THE ITCH will of course be performing on stage. Our singel "Propaganda" was played last Thursday on Swedens top hardrock radio station Bandit Rock, in a segment called Bandit Most Wanted. To get the airplay we so dearly need PLEASE follow this link and request Propaganda! As often as you like! Please! We FINALLY have a date set for the release of our long awaited debut album "Spreading like wildfire" - May 27th! WOOHOO!!! We've heard the question a million times and now the time has finally come. We are happy to announce that our website is done. After years of meticulous preparations and almost no thought about what contents might be interesting we are now ready to launch this monster! Please, tell everyone you know to come on over to www.theitch.se and enjoy our beautiful contribution to the World Wide Web! By the way, Rocket 95.3 FM is now, much to our surprise, playing what is to be our new single – Propaganda! It appears it’s been added to their top played 29 songs this week. You are more than welcome to help out by contacting Rocket 93.5 and requesting some more Propaganda!